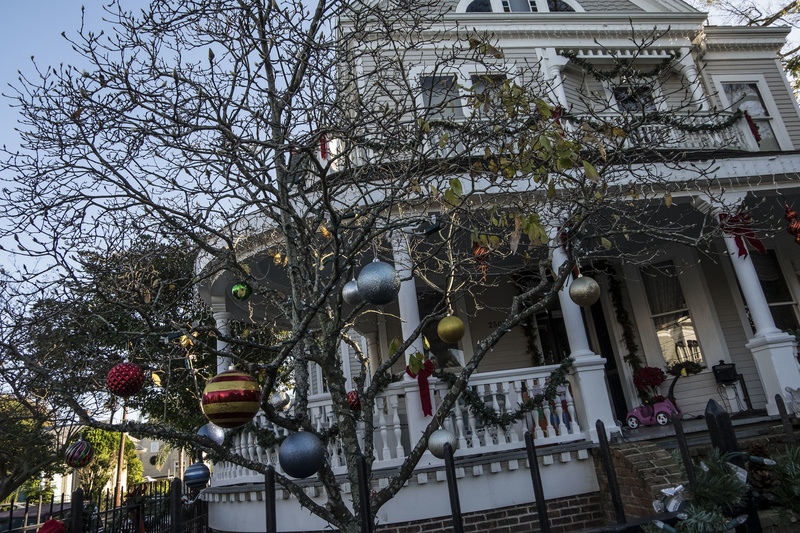 This year, New Orleans will be celebrating its 300th Christmas. That’s 300 visits from Papa Noël, 300 gumbo-laden dinners, and 300 eggnog-induced hangovers. Of course, we all have our own ways of celebrating the festive holiday, and traditions have come and gone, been altered and been modified, over these many years. Maybe your tried-and-true family traditions are to hang the stockings, roast the chestnuts, and string the popcorn. Or maybe you’re more the type to dress your cat in an ugly Christmas sweater; bake gluten-free, dairy-free, farm-to-table fruitcake; and drink mimosas at Christmas Day Drag Queen Brunch. But whether you’ve got visions of sugarplums dancing in your head or visions of The Walking Dead on your TV, whether you saw Mommy kissing Santa Claus or her latest Tinder date, this is still the most wonderful time of the year. So, however you choose to celebrate the holidays, there are some traditions that never go out of style. Here are a few New Orleans Christmas customs that have stood the test of time. It’s become a cliché, but it’s a cliché based on hundreds of years of history: New Orleanians love to eat, and they eat well. One of the oldest holiday traditions in the city comes from this longstanding love of the vittles. Réveillon—which is based on the French word for “awakening,” though it is actually more accurately translated to “eve”—dates back to the 1800s. Back then, the highly religious population of New Orleans would attend midnight mass every Christmas Eve. And, as they were good, devout Catholics, they fasted for the entire day leading up to the evening mass. Unfortunately, however, hunger is a rather unwelcome distraction from the Christmas sermon, and by the time the congregation sang their last “Silent Night” of the service, they were all starving. But a lavish repast awaited them at home, and families and friends would gather together to break their fast in style—with meat, oysters, turtle soup, gumbo, rich desserts, and plenty of wine and brandy. Nothing wakes you up in the evening like a four-course meal, and some of these dinners evolved into an overnight pig-out that lasted till morning. 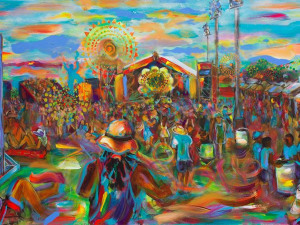 And they would do it all over again on New Year’s Eve. This custom dwindled and eventually fell out of favor by the 1940s, but there was a huge Réveillon revival in the 1990s (largely as a draw for tourists) that has continued to today—with one small change. These days, instead of eating in, Réveillonists tend to eat out. Many local restaurants offer a special Réveillon prix-fixe menu, often for the entire month of December (such as Antoine’s, Café Degas, and Bombay Club). Locals take advantage of the holiday season to try out a restaurant they’ve never eaten at before or to revisit an old favorite. If you’ve ever wandered along Canal Street during the holidays, you know that the thoroughfare is more decked out with boughs of holly and Christmas lights than all the halls in town. As early as the mid-1800s, businesses along Canal Street started decorating their storefronts and display windows with Christmas décor and showing off their finest holiday merchandise. Of course, this was a marketing ploy with capitalistic incentive, intended to seduce gift-seeking shoppers, but it was also motivated by a good dose of holiday cheer. Festively dressed revelers would saunter down Canal Street, soaking up the Christmasness as they admired the many window displays that gradually became fancier and more illuminated as time went on. 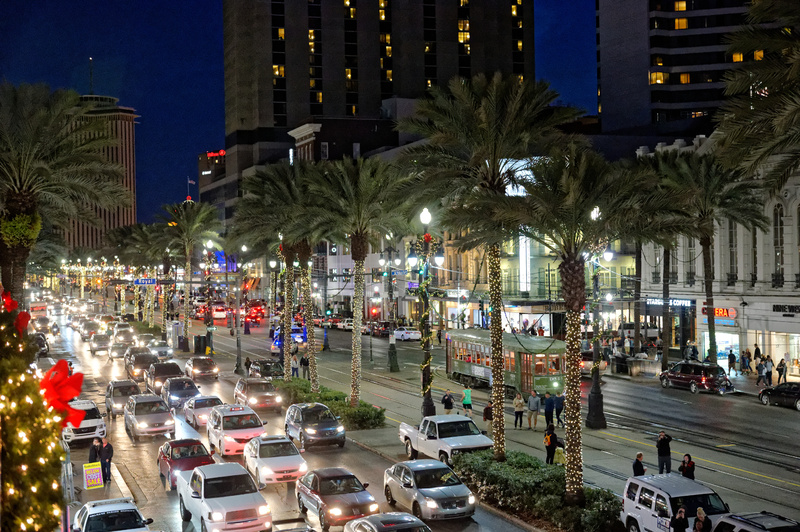 Today, the Downtown Development District hangs over a million sparkly lights on and around Canal Street every year, kicking off the season in late November with an official lighting ceremony, followed in early December by the annual Krewe of Jingle parade. Fa la la la la. Just off Canal Street and equally as oozing with Christmas is the Roosevelt Hotel (pictured above). The fancy hotel has been showing off its Christmas splendor since as far back as the 1930s, which, coincidentally, is about as long as Rockefeller Center in New York City has been sporting its colossal spruce. 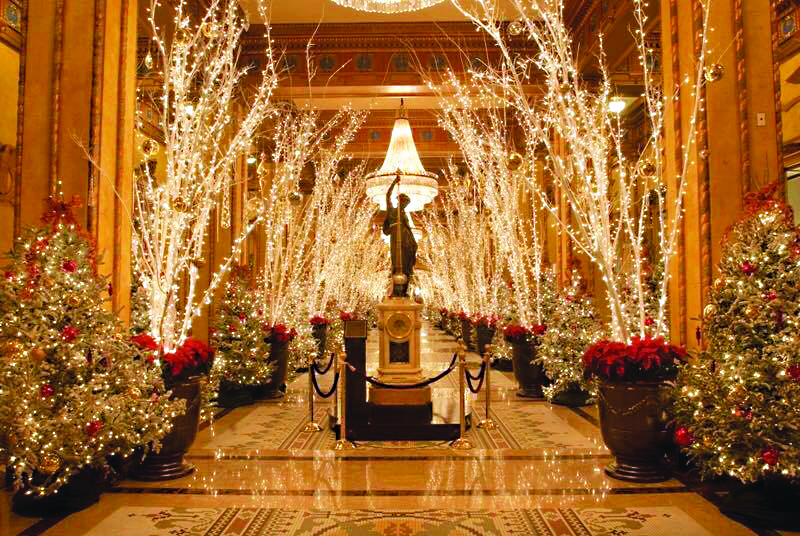 With nearly 113,000 twinkly white lights, including 1,610 feet of lighted garland, the lobby of the Roosevelt gets as lit as a drunken tourist on Bourbon Street. The hotel also displays an extended archway of gilded birch branches and as many as 124 flamboyant Fraser firs decorated with up to 4,065 hand-blown ornaments, 387 bows, and all those sparkling lights. The whole elaborate display takes 52 hard-working Roosevelt elves around 1,800 hours to plan, set up, and dismantle. That’s long enough to walk from here to the North Pole! (At least, North Pole, Alaska.) And in case Christmas tends to bring out your inner intellectual, it’s also long enough to earn approximately 18 PhDs. If you really want to make light of Christmas, Celebration in the Oaks (pictured above) is one of the best light displays around and one of the most integral parts of the holiday season here in New Orleans. Celebration in the Oaks came into being over 30 years ago as a fundraiser for the New Orleans Botanical Garden in City Park. It started out in 1984 as nothing more than a bunch of artistically decorated Christmas trees exhibited in a tent in the Botanical Gardens. And sadly, almost nobody came. 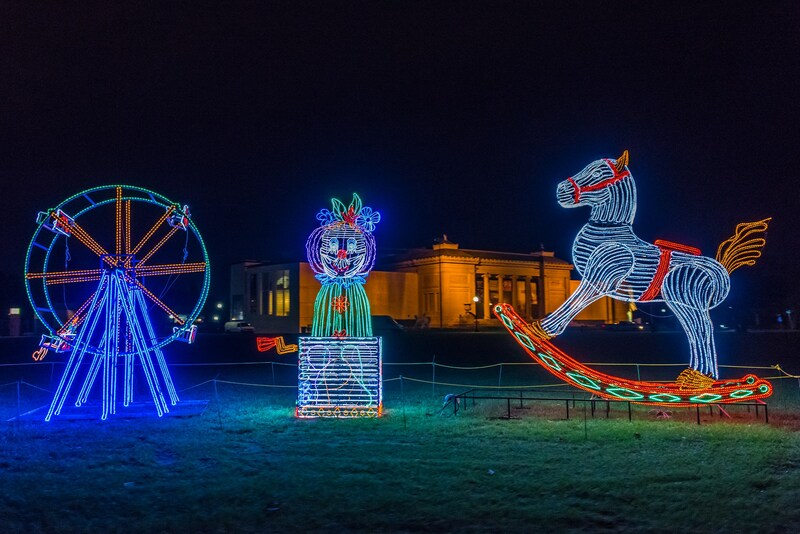 Luckily, by 1987, the idea was catching on—many more lights were being hung around the park, and many more people were coming out to see them. At this point, “Christmas in the Oaks,” as it was called then, was a driving event, and merrymakers would drive around from festive display to fancily lit oak tree by car. The next year, Storyland and the Carousel Gardens were added, and this was the first year of the annual two-mile Celebration in the Oaks Run/Walk that still takes place today. In 1990, 350,000 people—more than double the current population of Lafayette—came out to celebrate in the oaks. Nowadays, Celebration in the Oaks is quite the production, with nearly 600,000 LED lights hung around the park. (Interestingly, that’s the exact same number of reindeer in the world. A Christmas coincidence?) There are 42,000 LED bulbs in the famous “Dripping Snow” Tree alone, and 32,800 linear feet of rope light—which is enough to string from City Park to Metairie and back again. Other highlights of the event include the 500 poinsettias, mini-train, Cajun Night Before Christmas display, and, of course, Mr. Bingle. The celebration takes eight months of preparation to pull off and brings in more than 165,000 Christmas-craving merrymakers a year. In most places, nothing says Christmas like Santa Claus. But in New Orleans, Ol’ Saint Nick has some serious competition for the title of The Most Iconic Symbol of Christmas. Mr. Bingle is challenging him for that honor. Created in 1948 for the old Maison Blanche department store on Canal Street (now the Ritz Carlton Hotel), Mr. Bingle was designed as the store mascot and Santa’s right-hand man. With the body of a snowman, wings of holly, an ice cream cone hat, a red ribbon, jingle bells, and a candy cane in his red-and-white-striped mitts, Mr. Bingle is pretty much Christmas incarnate. Back then, he had an illustrious career, starring in daily puppet shows at Christmastime and appearing on radio and television. Maison Blanche marketed their iconic Christmas hero, selling plush Bingles and other related merchandise; dedicated an in-store museum to him; and even created a peppy little jingle (“Jingle, jangle, jingle, here comes Mr. Bingle”). The department store also kept a giant fiberglass figure in his likeness, displayed prominently above the entrance to their building. When the figure began to deteriorate, it was moved to a warehouse. During Hurricane Katrina, a levee nearby Mr. Bingle’s digs collapsed, but in true, Christmas miracle-style, Mr. Bingle survived. 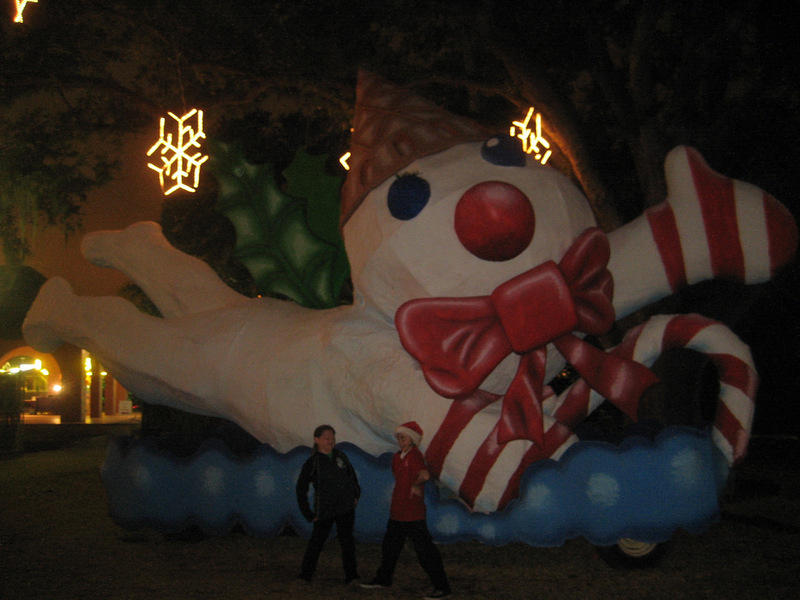 Today, the giant, flying Mr. Bingle replica has found a permanent home, appearing every Christmas season at Celebration in the Oaks in City Park, where he is visited, photographed, and loved. It wouldn’t be Christmas without him. You take a kid away from home on Christmas, and he or she is almost certain to ask, “But… how will Santa find me?” Well, in this part of the country, the answer is simple: He’ll follow the bonfires. In a Cajun custom that dates back at least two centuries, folks light as many as 200 bonfires along the levees up and down the Mississippi River in order to show Papa Noël the way to deliver his gifts—and also, likely, to show ordinary citizens the way to midnight mass. This may be a vestige of the archaic European convention of setting a bonfire in celebration of a good harvest. Locals build approximately 20-foot structures out of willow branches, cover them with cane reed, stuff them with wood and paper, and, come Christmas Eve, throw on some diesel fuel and set the whole thing ablaze. The towers used to be as tall as 40 feet, until one fell on some poor, unsuspecting reveler. They are usually a simple teepee shape, which actually resembles a Christmas tree, though sometimes people get creative and design boats, airplanes, or buildings—just to later destroy them by fire. Yes, the labor-to-longevity ratio is seriously skewed. 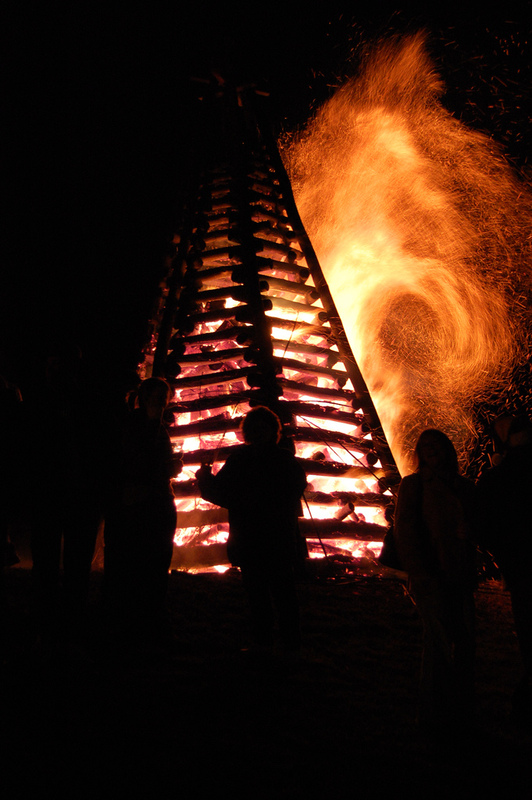 It takes about a month to construct a tower that will burn to ashes in roughly five hours. While the fires blaze on, people scarf jambalaya, drink beers, sing carols, and socialize, maybe even mingling with some of the thousands of tourists who come out to bask in the fiery glow of Christmas. The bonfires usually die down by midnight, just in time for everyone (except, perhaps, the tourists) to head to mass. New Orleans has had 300 years to come up with some pretty joyful holiday traditions, from caroling on Jackson Square to the Running of the Santas, and every one of these observances helps us to have ourselves a merry little Christmas. No matter what you put in your stocking or in your eggnog, there’s really no wrong way to ring in the holidays. Deck the halls, rock around the Christmas tree, and have a good, strong cup of cheer. 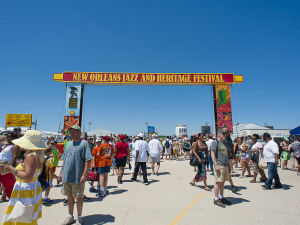 We know how to celebrate here; we’re New Orleanians. God bless us, every one.